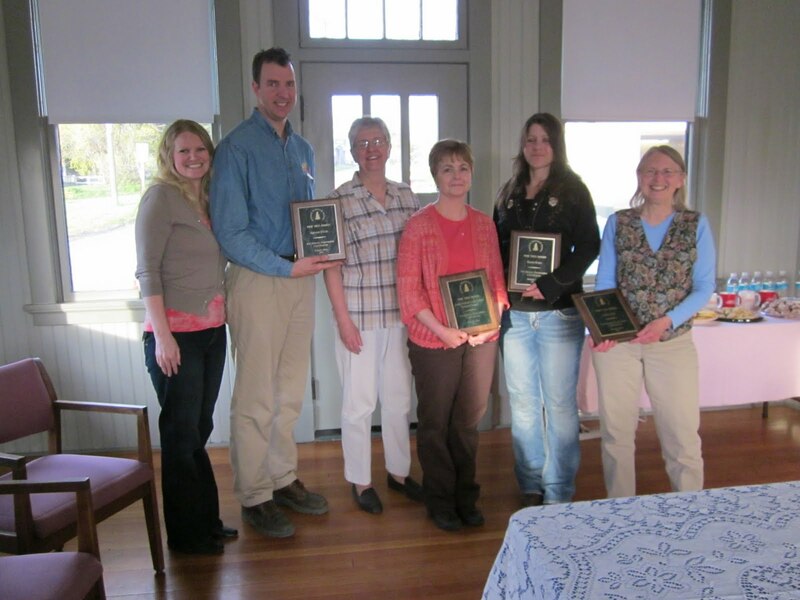 The Potlatch Historical Society chose the Depot as its venue for handing out its Pine Tree Awards on May 11. Pictured, left to right, are Amber and Dan Akins, Carol Haddock (PHS President), Cheryl Kreid, Karen Rohn and Lindy Seip. Dan and Amber accepted their award on behalf of the Akins family and Harvest Foods. The local market put up a variety of historical photos on its walls, and they've been greatly enjoyed by shoppers. Cheryl was on hand to accept the award for the Latah Federal Credit Union, which also chose to exhibit a variety of historical photos at the request of new CEO Lowell Stevens. Karen Rohn was cited for her excellent mural of the old sawmill, which was painted on the side of the Wagon Wheel in downtown Potlatch. Although they were absent from the evening's awards, Dale Spring and Diane Senften, owners of the Wagon Wheel, were also honored for hiring Karen to paint the mural. Lindy Seip, long-time PHS member and previous secretary, was thoroughly surprised by her White Pine Award, which was given in recognition of her loyal service to the organization. Lindy and her husband Bob Zemetra will be moving to Oregon where he will be taking over leadership of the wheat breeding program at Oregon State University. At the recent WIM HPG board meeting, the board voiced its hope that the Depot would be used for more community activities, so it was great to see PHS celebrate its Pine Tree Award ceremony there. In similar fashion, the Palouse Empire Rail Society will hold its monthly meeting at the Depot tonight as participants have signed up for an evening of pizza and train videos. And Karen Rohn, one of the HPG's newest members, will soon open on Fridays to display her art and also sell HPG items from the Company Store. The dust has settled at the depot, and with some luck, 20 volunteers now feel a little less stiff and sore after the hard day of demolition last Saturday. The amount of work that got accomplished was amazing, and the WIM HPG especially thanks the US Bank team for donating their community service hours to the depot project. Kenny, Michelle, Caryn, Shannley, Tori and Phil not only furnished muscle power to take off countless buckets of lathe and plaster, but they also brought most of the food. "Thank you" is just not enough, especially to Tori Van Allen and Phil Omlor, who traveled from the Post Falls area. Phil said he'd done similar demolition work at Fort Missoula some years back, and Tori, who hails from Kellogg, is no stranger to historic building projects either.﻿ Pictured at right are Jim Haddock (left) and Don Somers who got started rolling waste materials down the chute. Thanks to Webb French and sons Ben and John, the ceiling had already been taken down, and the French team also devised the chute. Barb West, Jim's sister-in-law, is a frequent volunteer who gives a solid day's work. The mask is a nice touch, don't you think? Given the huge amount of dust, masks were necessary. It almost appears that people were working underwater given all the dust particulates floating past the camera lens! Board member Webb French brought son Joe along to help with demolition, althoughthe French family had already done a huge amount of work the previous Saturday. Webb did admit that lunch was a nice incentive to return to work this Saturday! Although Benand John were absent this Saturday, we thank them for their work this past week. The newest teller at the Potlatch branch of US Bank, Shannley Moon, gets busy with the hammer and chisel, as her husband Jonathan works in the adjacent room. Jim Haddock, above, and Joe Griffin, below, were not afraid of the hard work, but they did seem a bit camera shy! Dave Cada was no slacker, piling up plenty of plaster in his dusty space. Interestingly enough, Dave spent his first year of life in the depot, where his parents Dorothy and Joe Cada lived in one of the upstairs apartments. Thus he has a great historic tie to the depot. Dave currently serves on Potlatch City Council. Project manager Jim takes a break with brother Mike West. Mike and his wife Barb retired last year and were agreeable to getting up early to come and work. Thanks, you two! He earned his lunch and more! Stirring up the dust--good reason for the masks!